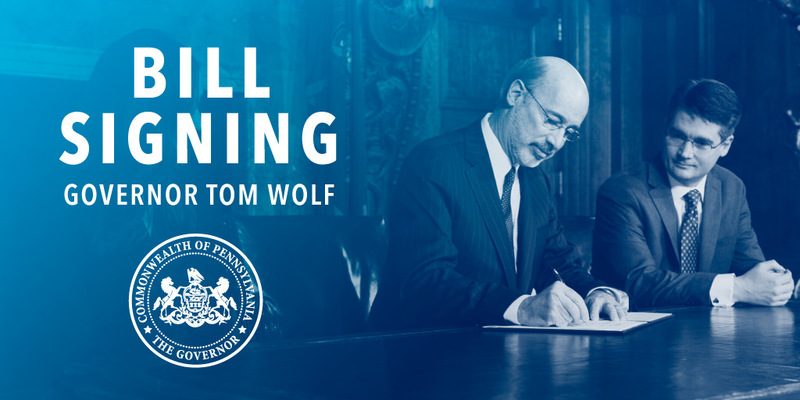 Harrisburg, PA – Governor Tom Wolf today signed Senate Bill 166, sponsored by Senator Stewart Greenleaf, into law, which expands criminal record sealing in Pennsylvania in order to reduce recidivism, relieve the pardon system, and provide ex-offenders greater opportunity to join the workforce. Governor Wolf was joined today at a bill signing ceremony by Sen. Greenleaf, Rep. Jordan Harris, chairs of Judiciary committees and various criminal justice organizations. “The United States is the world leader in incarceration and a criminal record often carries a lifetime of consequences that often lead to poverty or re-incarceration,” Governor Wolf said. “This law is a commonsense, positive and unprecedented step to help Pennsylvanians with minor or dated criminal records have a fighting chance at opportunities for gainful employment. SB 166 amends Title 18 (Crimes and Offenses) to allow individuals who have served their punishment and remained free of arrest or prosecution for seven to ten years, for nonviolent misdemeanors, to petition the court for their record to be sealed from public view. Between 70 and 100 million Americans, or as many as one in three American adults, have some type of criminal record. A recent report estimated that between 33 and 36.5 million children in the United States—nearly half of all U.S. children—have at least one parent with a criminal record. A criminal record often carries a lifetime of consequences, and even a minor criminal record can be a serious impediment to employment, housing, education and training, public assistance, financial empowerment, and more. More than half of U.S. states (27) allow some misdemeanor and even felony convictions to be expunged or sealed. This Act allows certain criminal records to be sealed, meaning that law enforcement and state licensing agencies will continue to have access to those records – but those records will no longer be an impediment for employment or housing.